THE EXON SINGERS, founded in 1966, is recognised as one of the UK’s leading chamber choirs. 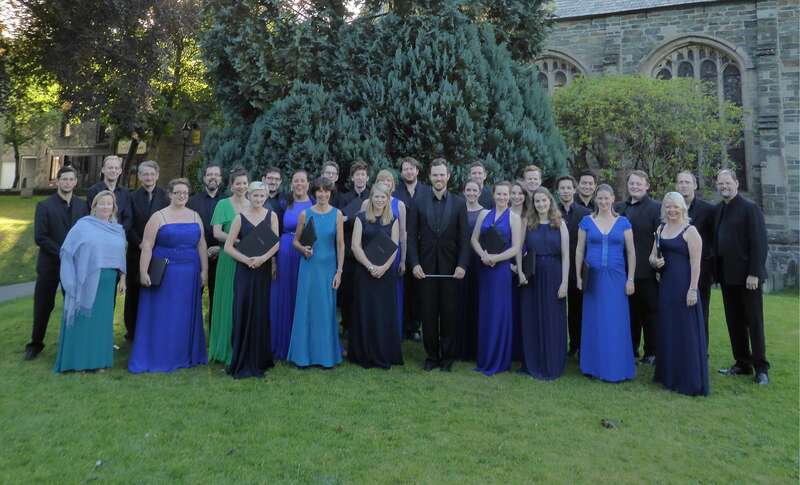 It has become renowned for its dynamic and expressive performances of music from the Renaissance to the present day, with reviews describing the choir’s performances as “brilliantly sung” (Classic FM), with “beautifully tailored singing” (Gramophone), and a “brilliant soprano sound” (The Daily Telegraph), where “The Exon Singers excel” (BBC Music Magazine). The choir broadcasts regularly on BBC Radios 3 and 4 and has made a number of highly acclaimed recordings for Albany, ASV, Delphian, Regent and Rubicon Classics record labels. The choir’s Artistic Director and Conductor is Joseph Judge, successor to Richard Wilberforce, Matthew Owens, Andrew Carwood, Christopher Tolley and Chris Teuten. Under the direction of Matthew Owens, the choir received considerable recognition for its commitment to commissioning new works from some of today’s most exciting composers. The choir has welcomed many of these as Festival Composer-in-Residence, including Richard Allain, David Briggs, James Burton, Brian Chapple, Gary Davison, Robin Holloway, Grayston Ives, Francis Jackson, Gabriel Jackson, Matthew Martin, Philip Moore, Joseph Phibbs, Howard Skempton and Philip Wilby, and in 2018 Russell Pascoe. Richard Wilberforce’s final project with the choir in January 2018 was a recording of the music of Toby Young, who had been Festival Composer-in-Residence in 2017. To celebrate the choir’s 50 years of music making and its 50th Festival, they recorded a new CD of music commissioned by them for Choral Evening Prayer, Before the Ending of the Day, released on Rubicon Classics. Click here for more details. The disc was given 4 stars in its review in the July 2017 edition of BBC Music Magazine. Since 1973, the annual Exon Singers Festival has been based in the historic market town of Tavistock on the edge of Dartmoor, and includes the beautiful venues of Tavistock Parish Church and Buckfast Abbey. The choir’s festival performances include the Oxford Festival of Contemporary Music and the Edinburgh Festival, as well as concerts in St John’s College, Cambridge, Gloucester Cathedral, Wells Cathedral and at venues in Winchester, Salisbury and Belfast. The 2019 Exon Singers Festival will run from 30th July to 4th August, and will include a Come and Sing Workshop Day on Saturday 13th July. Full details of both the Come and Sing Workshop Day and the 53rd Festival will be announced shortly. More info on becoming a friend of the Exon Singers.